Discover Sofitel Brussels Le Louise a 5 star luxury hotel in Brussels prestigious Avenue Louise district nestled amid quiet streets lined with chestnut trees designer boutiques and art deco mansions. With its stunning plays on color and light this stylish hotel blends Brussels historic beauty with French art de vivre. Please join us for a Magnifique voyage into the heart of Brussels where Belgian traditions dissolve into stylish modernity and French art de recevoir. Life is Magnifique in Brussels..
Each Sofitel is a unique blend of the French art de vivre and local refinement. 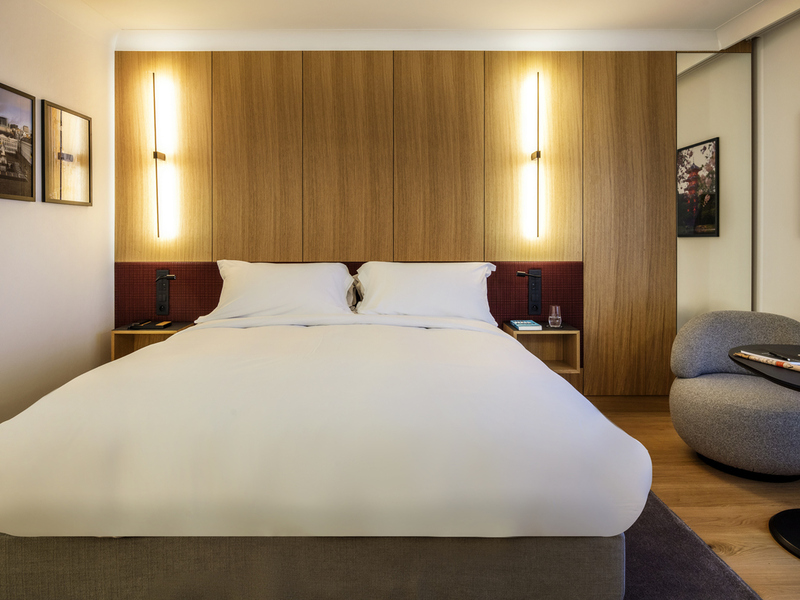 Just steps from Avenue Louise in the Sablon quarter, Sofitel Brussels Le Louise opens the door to a chic, exciting and eclectic world. Step into the theatrical decor that showcases the true style of historic Belgium. The vast glass wall in the lobby evokes delicate Brussels lace and reflects the sumptuous amethyst luster of hand-made crystal. The magnificent splendor of Princess Louise, daughter of King Leopold II, appears in each design detail. And the surrealism of Brussels painter René Magritte permeates the hotel through a myriad of subtle references. Creative gastronomy mixes the classics with modern cuisine in a boldly elegant setting. After a stroll along Avenue Louise, meet up at the bar to sample delicious chocolate truffles with a glass of champagne. From the intricate, decorative stonework of the Grand Place to the futuristic architecture of the Atomium, a visit to the Magritte Museum or a gourmet chocolate tour of the city, the exciting European capital is best discovered at a leisurely pace. 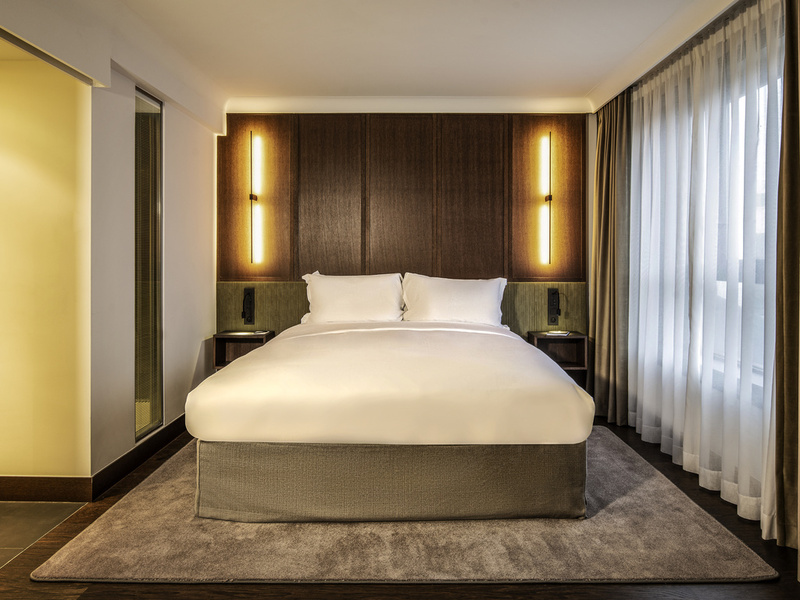 All rooms are tastefully furnished and equipped with Sofitel's 'MyBed' for a good night's sleep. The amenities include a bath and shower, TV, mini-bar, high-speed and broadband Internet access. In our luxurious So Well Suite the queen of Brussels accommodation unwind in the hammam and jacuzzi or sink into Le Sha relaxation chair with soothing sounds and soft light. Junior suites offer ideal accommodation in Brussels for families. 24 SQM / 253 SQFT, Stylish and Sophisticated Décor, Sofitel MyBed, Rainshower (Bathtub upon Request), Hermès Bath Amenities, Complimentary Wi-Fi, Flat Screen TV, Bose Wave Radio, Laptop Safe, Tea Making Facilities. 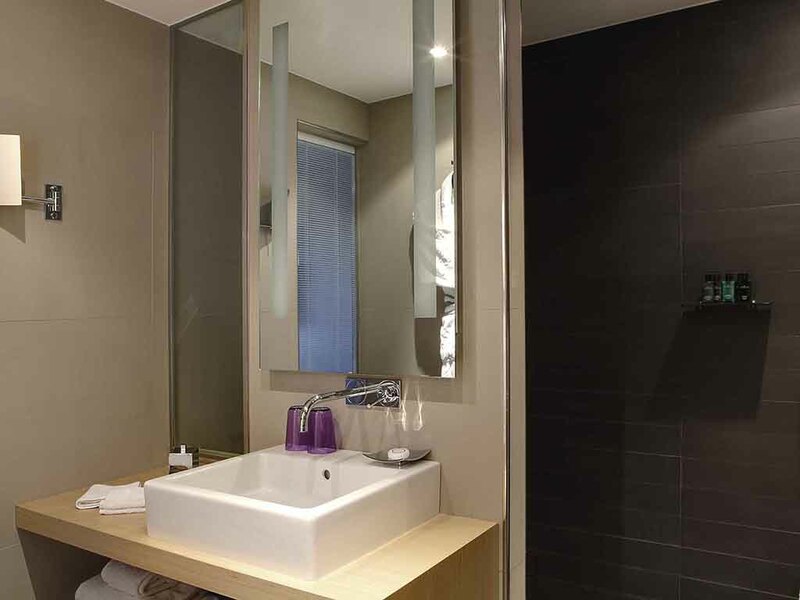 24 SQM/ 253 SQFT, Stylish and Sophisticated Design, Sofitel MyBed, Rainshower (Bathtub upon Request), Hermès Bath Amenities, Complimentary Wi-Fi, Flat Screen TV, Bose Wave Radio, Laptop Safe, Tea Making Facilities. 26 m² (280 sq. ft.), Stylish and sophisticated, feather MyBed, garden view, complimentary WiFi, rainshower (bathtub upon request), Nespresso and tea making facilities, laptop safe, Bose® wave radio, flat screen TV and minibar. 28 m²/ 301 ft². 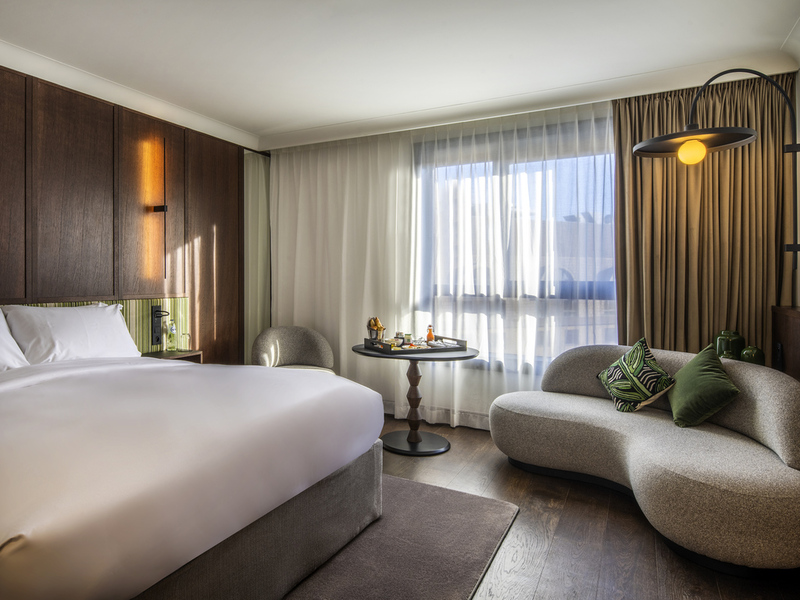 Upper Floor, Stylish and sophisticated, Sofitel MyBed, Rain Shower (Bathtub upon request), Hermes Bath Amenities, Complimentary WiFi, BOSE Wave Radio, Flat Screen TV, Nespresso Coffee Machine, Laptop Safe and Mini-Bar. 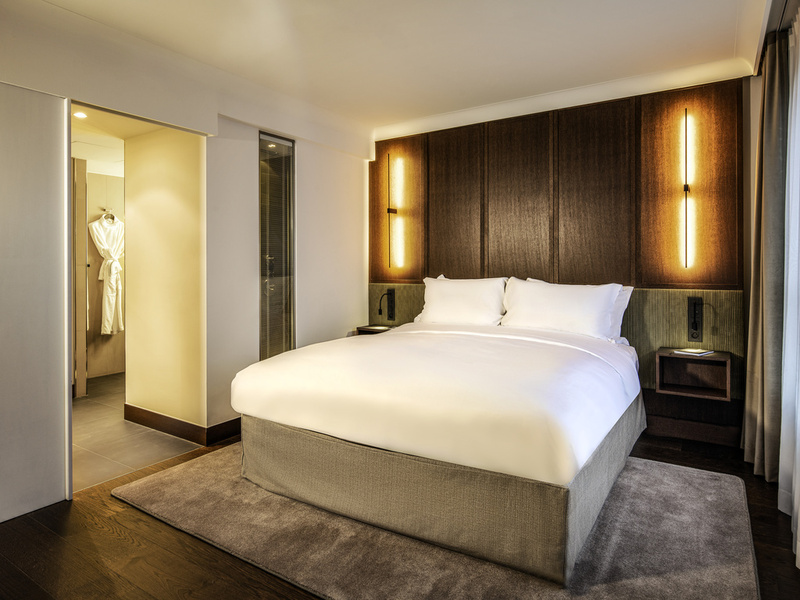 28 m2/ 301 sq.ft., High Floor, Stylish and sophisticated, Sofitel MyBed, Rain Shower (Bathtub upon request), Hermès Bath Amenities, Complimentary WiFi, BOSE Wave Radio, Flat Screen TV, Nespresso Coffee Machine, Laptop Safe and minibar. 37 m² (398 sq. ft.), Stylish room, garden view, feather MyBed, lounge area, Nespresso machine, Bose® radio with iPod dock, complimentary high-speed Internet, bathtub and rain shower, 2 flat screen TV's, laptop safe and complimentary minibar. 50 m² (538 sq. ft.), Stylish room, garden view, lounge area, dressing room, Nespresso machine, Bose® wave radio with iPod dock, complimentary high-speed Internet, bathtub and rain shower, 2 flat screen TV's, laptop safe and complimentary minibar. 92 m² (990 sq. ft.), Opera Suite, courtyard views and city views, spacious and cosy lounge, rainshower and bathtub, hammam, Jacuzzi, fitness equipment, complimentary high-speed Internet, relaxation area, Wii entertainment console. The Crystal Lounge restaurant and bar offers a cosy and trendy place in the middle of the Louise district, renowned for its numerous cocktails. Far from the bustle of the city, it welcomes you all day and possesses a smoking room and a great terrace. Backlit shelves of crystal decanters handmade by Belgian craftsmen line this stylish bar in Brussels while music from live DJs enlivens some evenings.Behind the bar Belgiums most celebrated mixologist conjures up champagne cocktails. Sumptuous design and furnishings create the perfect spot to enjoy a gourmet break. Discover a thousand and one flavors of Mediterranean cuisine, revisited by Adwin Fontein. The Crystal Lounge is open from 11:30am on specific sundays for an irresistible brunch with family or friends. Award-winning chef Adwin Fontein inspires gourmet creations - from foie gras to monkfish - in this sleek restaurant in Brussels. Soak up the Zen atmosphere of a leafy terrace with a relaxed Sunday brunch or cheeseburger paired with a Belgian beer. Antoine Pinto's theatrical style adds spice to this chic Brussels bar: amethyst crystal with chrome details, chocolate leather banquettes on hardwood floors. Transform a pre-dinner drink or power lunch into a moment of refined refreshment. Close to the European Parliament embassies and NATO headquarters this Brussels business hotel is ideal for corporate events or important conferences in Brussels for up to 200 people. Business facilities in this central Brussels hotel include four naturally lit meeting and conference rooms. Enjoy complimentary Wi-Fi state-of-the art audiovisual equipment a business lounge and event planning services by our Inspired Meetings team. Greet clients in the bright airy Toison dOr Boardroom overlooking the garden or lead a Brussels conference in a surrealist meeting room. Hold a cocktail party or dinner in a private dining room or under the stars on the citys largest hotel terrace. 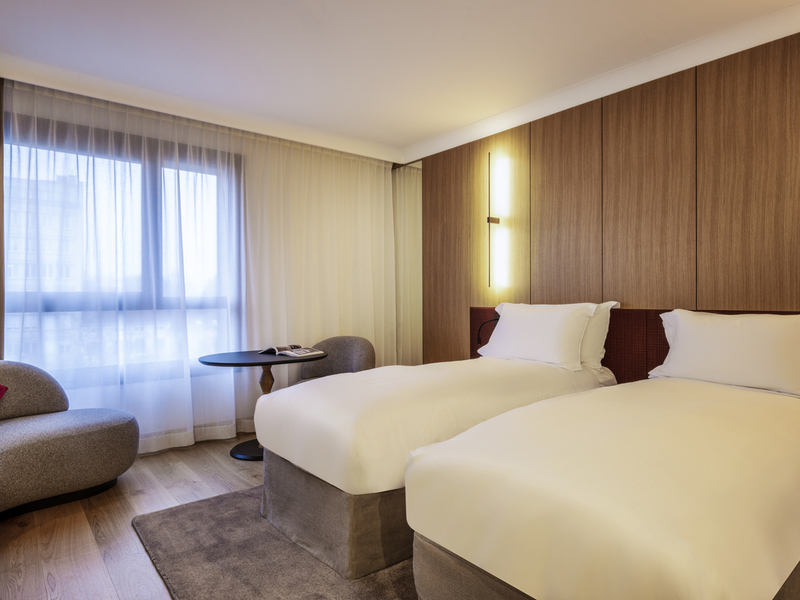 Sofitel Brussels Le Louise has all the facilities of a 5-star hotel in Brussels, including a modern fitness center, dry cleaning service, parking and babysitting. Our best quality is our cousu main service from knowledgeable concierges and staff. Discover Sofitel Brussels Le Louise tucked in the upscale Avenue Louise shopping district, and sip tea on the vast, peaceful terrace. Designed by renowned architect Antoine Pinto, the hotel blends Belgian surrealism with renowned French elegance.